Unsure of what to make? Are you confused about how to fuel yourself and your family? In today’s world, it is becoming increasingly difficult to understand what to eat to fuel your body, maximize your health and live an active lifestyle - especially if your’e living with diabetes and are confused about what to eat in order to control your blood glucose with precision. It turns out that fresh fruits and vegetables are the quickest and healthiest option for those with a busy schedule. Imagine waking up and having to run out the door without any breakfast. Your morning is miserable because you haven’t had an opportunity to provide your body with high-quality fuel, essential to power you through the day. Now imagine waking up only 10 minutes earlier. You grab a few bananas, a few peaches, and a handful of berries. You’re out the door in minutes, but this time you’re fueled for the day, with more than enough energy to handle your busy schedule. The bottom line: fresh fruits and vegetables are powerhouses of nutrition, providing an abundance of micronutrients to support tissue function. Beyond eating fresh produce, here are 5 low-fat, plant-based, whole-food recipes that are sure to provide your taste buds with the party they desire, and give your brain and muscles the nutrition they deserve. Mangoes add a tropical flair to any morning. 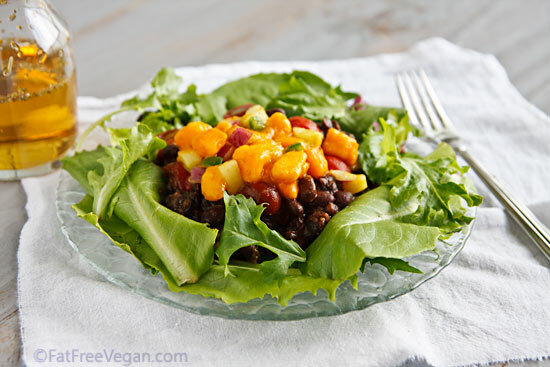 Throw the Mango Salsa and a can of black beans together and head out the door. This great breakfast option is guaranteed to keep you fueled for a busy day. It is also container friendly, and makes a great lunch option when used to top a bowl of quinoa. Use it to top a luscious bowl of greens for dinner. NOTE: These values are for one recipe of Mango Salsa with a 15 oz. can of black beans. This dish is requires some chopping, but it can be made a few days ahead and kept in the fridge. Throw it on top of quinoa or rice if you need more fuel super busy days. Use only ¼ of an avocado to reduce the total fat content, and serve immediately if you're in a rush. NOTE: Using 1/4 an avocado reduces the fat to 2g per serving. Rated the tastiest meal of 2015 and 2016, this squash, sweet potato and corn chowder is an instant hit. Make a big batch of this at the beginning of the week and eat it over several days. Calorie dense, this soup is sure to provide you with ample energy. This is a fabulous recipe if you are looking for something quick and flavorful. 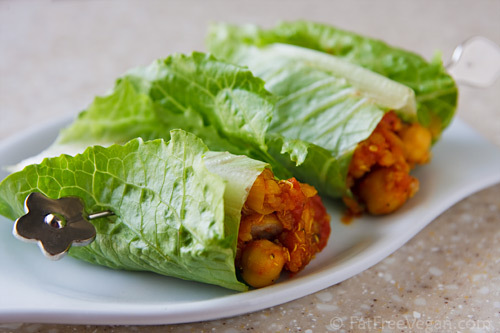 Eat it warm or use it cold as a filling for lettuce wraps to make a healthy and nutrient dense meal option. Hearty. Healthy. Cheap. Easy. Fast. Filling. This recipe is incredibly tasty, and filled with turmeric, coriander and cumin to delight all your senses. What more do you want? What recipes are you in the mood for? Tell us and we'll be sure to design them for you.